The Rolls-Royce RB.53 Dart is a long-lived British turboprop engine designed, built and manufactured by Rolls-Royce Limited. First produced in the late 1940s, it powered the first Vickers Viscount maiden flight in 1948, and was still in production until the last F27s and H.S 748s were produced in 1987. Following the company convention for naming gas turbine engines after rivers, this turboprop design was named after the River Dart. 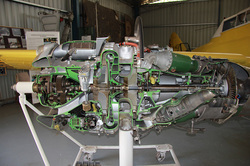 The Dart engine on display at the Museum is sectionised for training purposes.